BHOLANATH 1.8⁰ Cool HIGH TEMPERATURE Stepper Motors Case temperature up to + 155°c . Since motors generate own heat, the maximum recommended ambient operating temperature is 120°c. Tested for continuously operating at ambient temperature of 120°c for five hours. Stepper motors are available for ambient temperature of 80°c, 100°c & 120°c Stepper Motors High Torque Hybrid, BH86SH65-6004AKS -HT, NEMA 34(86 mm - S) Frame size, Bipolar (4 leads), Holding Torque 27.4 kgcm (2.74 Nm), Current per phase 6 Amp, Motor length 65 mm.With a Key Way, 300mm Wire Length, Operating Voltage 48 - 170 VDC. For complete details please view Technical Specifications. 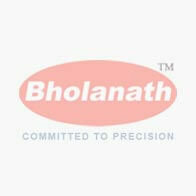 Download Technical Specification Sheet of BH86SH65-6004AKS -HT BIPOLAR 27.4 kg cm (2.74 Nm).